I installed high Sierra a few months ago and nowadays there seems to be a problem with System Information.app, it always shows the disk usage wrong like for example System 40GB but it shows photos to be 0KB even though I have 19GB worth photos and DaisyDisk reports correct disk usage. I have run this scan as root user not admin. so how do fix this missing photo sizing in system information.app? Apple state that they automatically remove local snapshots when disk space is low, but their definition of low is apparently only 5GB of free space remaining – not really much free working space in 2017 when you might want scratch space of 22GB for 1 hour of 4k 30FPS footage. Most likely the space is taken by Time Machine. It keeps making local snapshots when the persistent TM storage is not available. The local snapshots can pile up to as much as 80% of disk space. After the next backup, or when the disk space runs low, the local snapshots are automatically removed by macOS. So this is not really a problem that needs a fix, the system will take care of it. That said, I'd agree that the System Information app needs a fix on High Sierra. It seems to include the local snapshots into "System" category and therefore it appears as used space, while Finder counts the snapshots as "purgeable", including it into the "available" space. This inconsistency is confusing. I had a similar problem just now: Finder, "Get Info", and Disk Utility were all reporting 18GB free on a 250GB SSD that should have had plenty of free space. 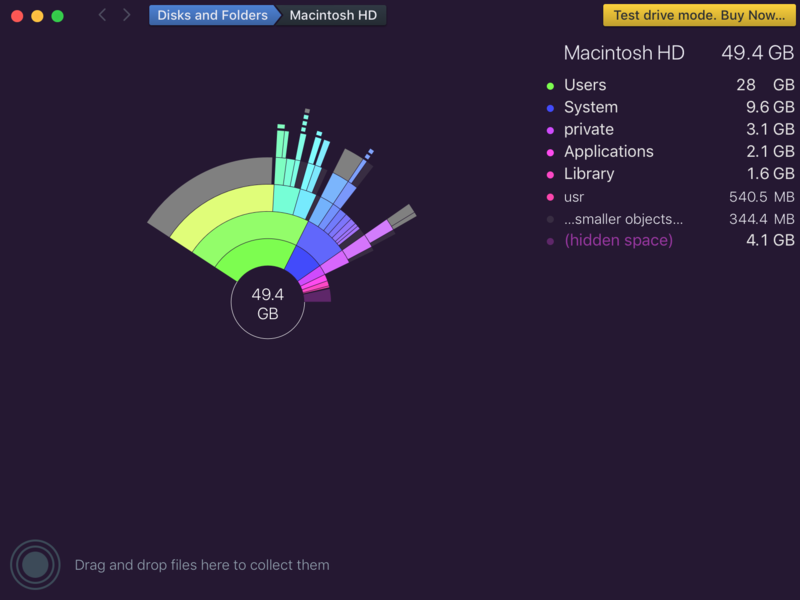 Under "About this Mac"->Storage, it reported 130GB of "System" usage. 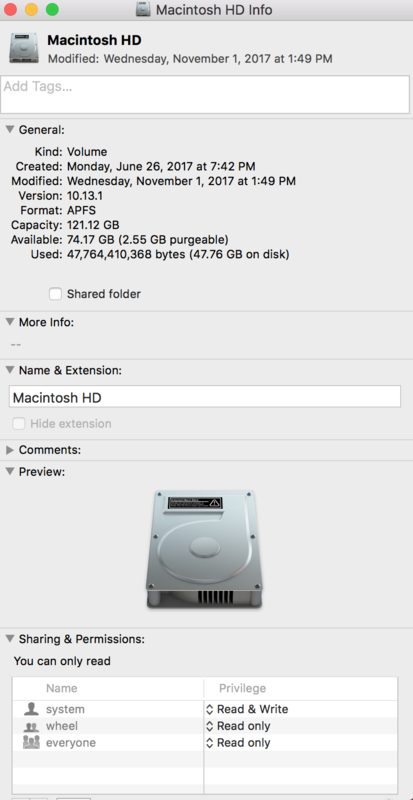 None of the space was listed as "purgeable", and macOS started complaining about lack of disk space. I found a solution in this Apple discussion thread. In my case, the problem was fixed by going to Time Machine Preferences and removing an old backup drive (that had long ago died) from the list of backup drives. Immediately, the available disk space on my SSD started being reported correctly as 120GB. After adding your particular hard drive, quit System Preferences then wait for a few seconds. Again open System Preferences → Spotlight → Privacy and this time remove your previously added hard drive. What this does is it reindexes and creates the .Spotlight-V100 files on your hard drive. There are also various sudo commands to perform this step but for now try this! I found that just opening the Storage Administration window (in System Information) fixed this. This was important as I needed to restore my photo library from Time Machine and throwing the broken folder in the trash and emptying the trash did not release the diskspace. 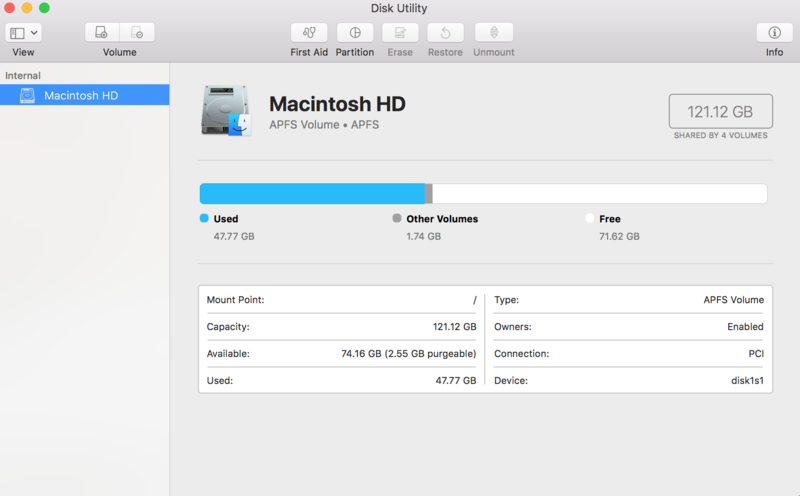 Disk Utility said there were five snapshots on the disk which most likely was the culprit. I have Carbon Copy Cloner installed (https://bombich.com) and it has a feature called CCC Snapshots. It occupied more than 200 GB of deleted data for a future backup in form of a snapshot (see https://bombich.com/kb/ccc5/leveraging-snapshots-on-apfs-volumes). When I used tmutil listlocalsnapshots / there where two entries regarding Carbon Copy Cloner. You can delete them using the CCC user interface: Select the hard drive in the lower left and then you get a list of snapshots that you can delete. I solved this issue just relaunch finder. Click on apple logo->Force Quit->Finder and click Relaunch. So I opened my finder and it shows the correct size. Has Unix directory usage or policy changed in High Sierra?